Break out the party hats and the noisemakers! It's time to ring in 2015! 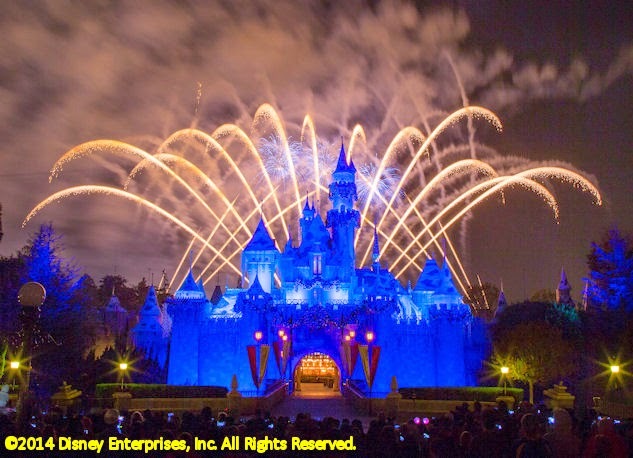 Anthony and I have all the info for making the best of your New Year's Eve visit to Disneyland or Walt Disney World. Just don't mind the crowds, because it's going to be packed. Both Disneyland and the Magic Kingdom at Walt Disney World reached capacity on Christmas Day and the gates closed to new guests for several hours. You know that's going to happen again on December 31st. So, arrive early, take a chill pill and pace yourself. And along the way, enjoy the special entertainment, music performances and fireworks extravaganzas that await you heading into the Disney new year. Anna Kendrick stuck on the steps of the palace in Into the Woods. Into the Woods is a dark and delightful adaptation of the Stephen Sondheim Broadway musical. I caught it over the weekend and highly recommend it whether you're a fan of movie musicals or just appreciate great cinematic storytelling. I've also fallen in love with Anna Kendrick, who plays the tormented and torn Cinderella, but I digress. Apple Pay technology is now live at Walt Disney World. Got that new iPhone 6 or iPhone 6+ for Christmas? You can now use it for purchases in and around the Florida resort. We were excited about the Marvel Experience making it's debut in Phoenix, but less-than-stellar reviews on Yelp have us second-guessing our enthusiasm. Anthony and I might wait until the superhero circus hits San Francisco before we check it out. We hope the bugs are worked out by then. Bob Iger blah blah blah Fortune interview blah blah blah technology blah Pixar blah Marvel blah Lucasfilm blah blah OH MY GOD DID YOU SEE THE PICTURE OF HIM WITH THE MILLENNIUM FALCON?!?! blah blah blah blah blah MagicBands. Bob Iger with the Millennium Falcon. NBD. Disney's Frozen was the second most pirated film of 2014 (The Wolf of Wall Street was number one). Guardians of the Galaxy didn't make the top 20, proving that even thieves will pay for quality. which dedicates itself to preserving Walt Disney's railroad legacy. Hey, the guy liked trains. The barn opens to the public once a month on the third Sunday of each month. for Tinker Bell in Disney's Peter Pan. It seems Margaret has also bumped into a celebrity. abilities of steam powered engines. Ask them to crush an aluminum can for you. The Retlaw 1 Combine once ran the rails on the Santa Fe & Disneyland Railroad. Today, it's on display right next to Walt's Barn. Both the exterior and interior of the combine have been fully restored. when my dad shot this footage at Disneyland in 1964. I was two years old. Jump to the 5:20 mark to see the combine in action. Happy Holidays from Walt's Barn! If you listened to Monday's Inside The Mouse Castle, you know that until this past weekend, it had been a long time since I enjoyed the holiday season at Disneyland. You also know that it was the first Christmastime trip Anthony ever took to the Happiest Place on Earth. Yeah, we're slackers. We know. Christmas is an especially crowded and hectic time at Disneyland, but it's also a beautiful and unique experience unlike any other yuletide celebration on Earth. Most importantly, it's an experience that needs to be shared. Please enjoy these holiday photos from Disneyland and Disney California Adventure. Click each photo to enlarge the image. Sleeping Beauty Castle at night. Sleeping Beauty Castle getting a magical holiday makeover. Main Street, USA at night. The Town Square Christmas tree. Disneyland Fire Department with Walt's apartment above. Luigi's Flying Tires will go flat in January. Carthay Circle and the Buena Vista Street Christmas tree. Mickey Mouse on the Red Car Trolley. from 500 pounds of gingerbread. Christmas tree in the Grand Californian Hotel lobby. Frozen Fun is everywhere at Disney California Adventure. Wandering Oaken's Trading Post in Hollywood Land. opened for the first time on Saturday night. Marshmallow gets some screen time during Freeze the Night. DJ Cool mixes the tunes at Freeze the Night. Ice sculptures created live on stage with a chain saw. props to DCA for not skimping on the booze. to the Storybook Land Canal Boats. Hoo hoo! Big summer blowout! Merry Christmas from The Mouse Castle!